This entry was posted in Literature, Travel and tagged Readathons, Travel the World in Books. Bookmark the permalink. This sounds like an excellent reading project! I love the variety in the books you selected for the readathon. Thank you, Joy! I just looked at your post, and I like your choice too. Focusing on one book or just a few at a time has its distinct advantages! I love the idea of this readathon–focused but still broad enough to appeal widely. I’ll be particularly interested in the Anderson bio. I love books like that 🙂 Good luck! Thanks so much, Jane! I have two Andersen biographies but I thought I’d start with his autobiography, which any later biographers must react to and take into account. These are great, I haven’t read any books in the countries you selected. I want to read the autobiography of Hans Christian Andersen. I think i have either his or the Grimm fairy tales on my Classics Club list. It would be very interesting to see what his real life was like. So glad you are joining us for the challenge and the Readathon! Great to meet you Lucy and hope you enjoy your journey through the Northern Lights countries. So glad you are participating! Huzzah! Your selections all look good, too! This is going to be so much fun. Looks like you have a great selection of books picked out! I hear the Hans Christian Anderson Autobiography is fantastic. I may have to add that to my list too! So excited you are joining us. 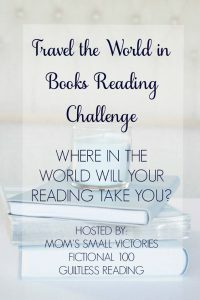 My travel the world in books challenge focuses on nonfiction books. I would ultimately like to come up with a master recommendation list of nonfiction books by country. I’m adding The Fairy Tale of My Life: An Autobiography by Hans Christian Andersen to my reading list. Can’t wait to see what else you read. That’s a great idea–I look forward to your master recommendation list! I’m working on master reading lists by category for this blog too, but the Readathon will push me to get started on the reading itself, beginning with the Andersen biography. Thanks so much for visiting! I’m pretty slim on my reading in this part of the world. I think it’s a great way to really focus one’s reading. Thanks for coming by my blog and I hope that you get your book maps going (two is pretty ambitious ;)) Happy reading! I doubt I’ll get to both maps, but I’m planning to start on the 100 fictional characters that I’ve been working with for a long time, and embed that map on a page at The Fictional 100. Then I’ll be ready to make a Northern Lights map to track future progress here. Thanks again! What a wonderful way to travel the world and go back through time, Lucy! I look forward to reading your words and reviews here on Northern Lights, a new place for my mind to board some great ships of thought. And Kay Nielsen who has passed into history, I will surely be visiting the beautiful work of this Danish artist here. He created some of the most magical countries in which to travel. Thank you so much, Naomi! You put things so beautifully. Thanks for reminding me that diverse and magical countries exist in the arts themselves, not only in lands bounded on maps. I’m very intrigued with the autobiography of Hans Christian Andersen. Good luck with the readathon and the challenge! Thanks, Deb! I’ve started the Andersen book, and he really does write about his early life with the tone of a fairy tale. Some later biographers have been critical of this, but in a way it makes transparent the kind of sifting and filtering that is true of any memoir or autobiography.